It’s the most wonderful time of the year. And usually overbooked. 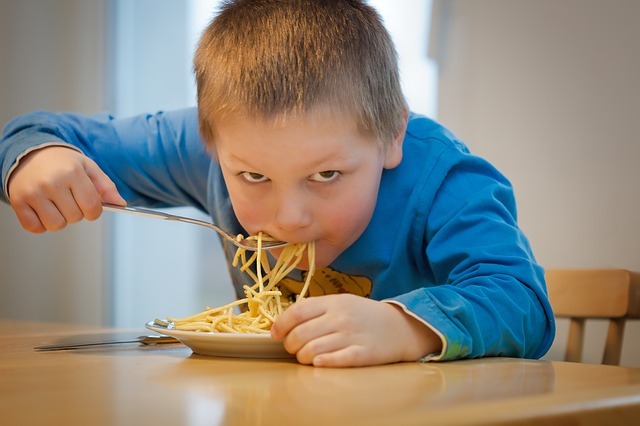 It can be difficult to find time for families to EAT, let alone eat a wholesome meal TOGETHER. Many of my posts tout the benefits of freezer meals and even freezer meal clubs to help avoid these busy-day situations, but when you’re IN these busy days, you’re probably not able to put together that menu and work plan. That’s when take-out or a meal out can sabotage budgets, diets and overall mood. Here are a few easy and nourishing meals that you can put together with little time, minimal effort and basic ingredients. Now, some of these are not completely balanced by most standards, but for that one crazy night, they’ll feed your bodies and souls without stripping your wallet and schedules. Bonus: almost all of these are kid-friendly! * young kids can help with some of the preparation. While very young children can help with some of these, supervision will be required for many. But these are great recipes to help children build their kitchen skills and cooking confidence. *+Pasta and sauce. A classic. If I don’t have an “emergency” jar of pre-made sauce stashed in the back of the pantry, I grab a big can of diced tomatoes or other tomato variation and toss in some spices (love Wildtree’s blend!). I usually have some parmesan on hand and voilà, dinner is served. Miso soup. If you don’t have any broth on hand, use miso. It stores well long term, so I always have a jar in the back of my refrigerator. Sometimes I mix it with broth for extra flavor and bone building benefits. La Montanita has a variety of wonderful misos, on the shelf and in the refrigerator. They vary in pricing and ingredients, so you can find one that works for you. Making miso is as simple as adding a scoop to hot water. Mix to blend. To that I add whatever I find in the refrigerator, especially leftovers: noodles, rice or grains, vegetables, fish or meat, raw egg. I then top it off with any fermented veggies I have on hand. +Canned tuna or salmon. It’s ready to go when you are, so keep a few cans on hand. In a real pinch, you can eat it straight from the can. But here are a few other easy variations. Add the fish to cooked pasta. Mix in an egg and fry up some patties, with or without buns. Or top a salad with the patties. Make a quick tuna salad by adding mayonnaise and chopped veggies. You can eat this straight or make tuna melts by spreading it on bread or toast and then melting cheese on top. Or, return to a classic tuna salad sandwich. If you have lettuce, tomatoes and other fixings, great. If not, plain tuna salad sandwich has its charms. 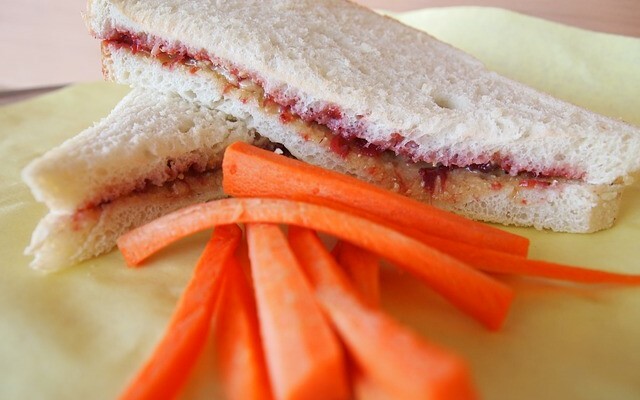 *This brings me to another childhood classic: the peanut butter and jelly sandwich. Oh the joy of the simple PB&J. The Captain requests this. Because I don’t actually make this often, it’s quite popular when I do. Keep it simple and add a glass of milk or switch it up to accommodate taste and your pantry. Use bananas for an Elvis favorite. Or substitute the jelly with some seasonal applesauce or apple butter, pear butter or even mash up whatever other fruit you can find in the house. Fruit (any fruit). Grapes are easy, apple slices work well, anything that’s finger food. Bread and crackers. Or pitas. This is a great way to use up odds and ends. Hummus. Or any sort of dip. +Mini pizzas. Use a base of regular bread, bagels or English muffins. We’ve also used eggplant slices with much success. Top with a pizza sauce (or tomato sauce with spices) and mozzarella cheese and bake until toasty and melty. If you have other toppings, add them. If not, you’ll still enjoy these treats. Do you have some leftovers but just not enough to satisfy everyone? Bulk up your meals with a quick cooking grain. Couscous and bulgur wheat are very quick. Boil water or broth, add the grain and let sit for a few minutes. Fluff up and serve. +Baked potato bar. A standard for us, even in non-emergency meal situations. You can either use leftover potatoes or bake some that night, if there’s time. While they take awhile to bake (try a pressure cooker for fast cooking), they take no oversight or work while they’re baking. Serve the potatoes with classic accompaniments like sour cream, cheese, bacon bits, chives, and butter. You can also add whatever else you might have on hand: chili, Chile, canned or leftover vegetables, canned or leftover mushrooms, salsa, and whatever else strikes you. Try this with sweet potatoes, too! Nachos. Grab some tortilla chips, spread on a baking sheet. Top with cheese, beans (canned or leftover) and/or available meat, and your favorite spices. Put into a warm oven and while the meal heats, scour the kitchen for toppings. Green Chile, tomatoes, salsa, sour cream, red onions, cilantro, jalapeños, olives and my personal favorite – sprouts! Even if you only have a very few to add, nachos are always a hit. The last few items are breakfasts that also make excellent and convenient dinners. +*Smoothies. These can be fruity, creamy, green, icy or even savory. Children can help by chopping or tearing ingredients and then get help running the blender. Fruits, milks, avocado, coconut, and greens are typical favorites. You can add whatever you have on hand and add your own favorite nutritional boosts: protein powder, nuts or nut butters, yogurt, PROBIOTICs, green powders, vitamins, whatever your family finds that works. *”Leftover” omelets. Most families have eggs available, so to those add your leftovers or pantry items and make omelets or hash. Potatoes, sweet potatoes, root veggies, cheeses, meats, greens, and onions are all great additions. For extra oomph, top with some of those nacho toppings listed above. *Parfaits. Yogurt, granola, and berries or fruit can be layered for a fancy effect or just mixed together for a filling dessert-like dinner. I wish you as low-stress a holiday season as possible with good health to carry you through. I hope these fast food meal ideas help you achieve your holiday happiness. Many Blessings! Whether you want to go full out on a pantry challenge or not, just knowing what’s in your pantry is a great way to save money and eat real food when plans to awry. So many awesome ideas!! I’ll try a few out during our busy holiday season. Thanks, KP. Granola for dinner probably isn’t a good idea every night, but on a crazy night, it’s cheaper and healthier than takeout!